Clover, like all legumes, takes nitrogen from the air and through a chemical reaction, deposits it in the ground as an absorbable fertilizer. In lawns, it provides a constant trickle of of fertilizer to itself and surrounding grasses – making the whole lawn more lush, green, and healthy. Clover grows deep roots and needs less water to stay green than grasses. If you see clover patches in lawns in the summer, it is usually green, while the rest of the lawn is brown and dormant. Clover spread throughout a lawn can can make it appear green year round. Dog owners usually have brown spots in their lawn from from their pet’s urine. Unlike grass, clover is highly resistant to this and helps maintain a uniformly green lawn. Clover can thrive in low fertility soils. 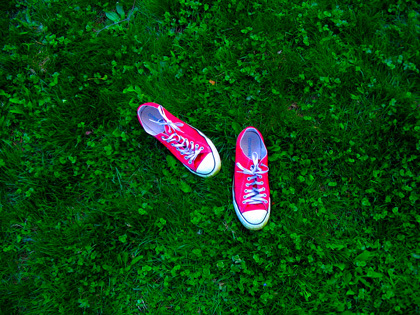 In fact, clover in a lawn is often a sign of low nitrogen levels in soil because it does so much better than grasses. Since it is nitrogen fixating, it can supply its own nutrients. 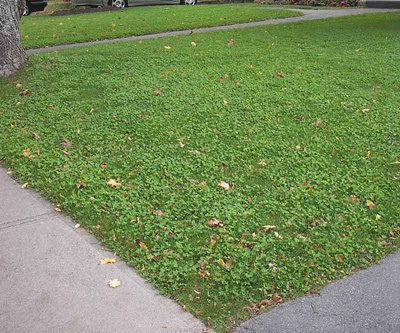 Overseeding clover seed into your existing lawn is an easy way to establish a clover lawn. There are many types of clover , the most widely cultivated are White and Red Clover. Large, high producing varieties are used for livestock forage. For lawns, the most popular is Dutch White Clover (Trifolium repens) because it is relatively low growing, tolerates close mowing, and out competes other foreign weeds. One clover seed company, Earth Turf, has an Overseed Clover Mix with a new type of clover called MicroClover, which is the smallest clover variety available and blends really well into lawns. It is mixed with highly drought tolerant grasses that will further help the lawn. 5lbs covers 1000 sq ft. The clover needs room to establish, so cut the lawn at the lowest mower setting, then use a thatch rake or rent a power dethatcher to remove thatch and thin the lawn. Spread by hand for small areas and use a broadcast spreader for large areas. If spreading pure clover seed, not mixed with grass seed, you may want to mix the seed with some sand or compost first to help spread more evenly. The soil needs to remain moist for good germination, so if it doesn’t rain, water everyday for the first two weeks. Water more if its hot out. The clover will sprout in 7-10 days. Earth Turf - Some of the best and most improved clover lawn and overseed mixes available.